My friend John Barnwell recently described the news media of our times as akin to “being in a wind tunnel”. This was true until the FBI’s arrest on Friday of the “MAGABomber”, Cesar Altieri Sayoc Jr., a homeless retired male stripper living out of a van that’s elaborately festooned with Trump stickers. Now, we’ve entered full Clownworld. A few grains of ricin the size of table salt can kill an adult human. On October 2nd, envelopes that tested positive for ricin were mailed to President Trump, Defense Secretary James Mattis and to Chief of Naval Operations, Admiral John Richardson. Two days later, police arrested former US Navy sailor, William Clyde Allen III of Logan, Utah in connection with those mailings. This story received next to no media coverage. 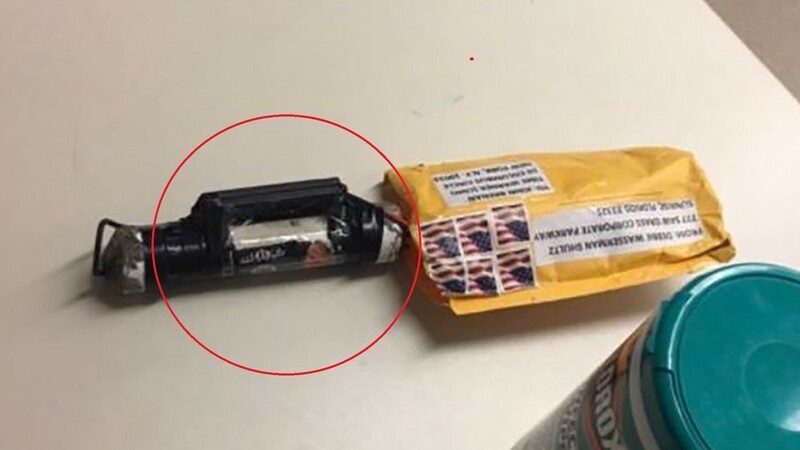 What has received wall-to-wall coverage on the Mainstream Media is a so-called “mail-bombing spree”, in which 13 packages containing prop pipe bombs were allegedly sent through the US Mail from Sunrise, Florida, without any of them being postmarked and all apparently having been hand-delivered to each targeted location, from NYC to California and in between. Bomb squads would have been called in to extract and to safely detonate the bombs. However, none of these “bombs” were detonated, likely because they couldn’t be. Some were even officially reported to be “incapable of exploding”. Nevertheless, FBI Director, Christopher Wray took great pains during a press conference to stress that the IEDs were “not hoax devices”. A fingerprint and a DNA match on the scotch tape used to seal the packages and on file with the FBI allowed the case to be solved at breakneck speed. Sayoc was initially cooperating with investigators, telling them that the pipe bombs wouldn’t have hurt anyone and that he didn’t want to hurt anyone. Sayoc has been charged with 5 Federal Crimes: 1) interstate transport of explosives, 2) illegal mailing of explosives, 3) threats against former presidents and other persons, 4) threatening interstate commerce and 5) assaulting current and former Federal officers. He is looking at 48 years in Federal Prison if convicted. At least he’ll have a roof over his head. 1) The MSM seemed to be on message with this story from the outset, with their coordinating headlines, which immediately referred to “bombs”, when these so-called bombs had no activator, no trigger and weren’t composed of any explosive substances. 2) The package sent to John Brennan at CNN had its contents taken out and photographed extensively, without any concern for safety. 3) The media has lead us all to believe that these packages actually arrived at the residences of Obama and the Clintons. The USPS does not deliver mail to anyone under Secret Service protection. All of their mail gets delivered to a Secret Service field office. If these packages were delivered to their private homes, they were not delivered by the US Postal Service. 4) Sayoc’s profile showed that he was a Democratic voter but shortly after everyone began posting about this, his profile was updated to Republican – but now, all of his social media accounts have been taken down. 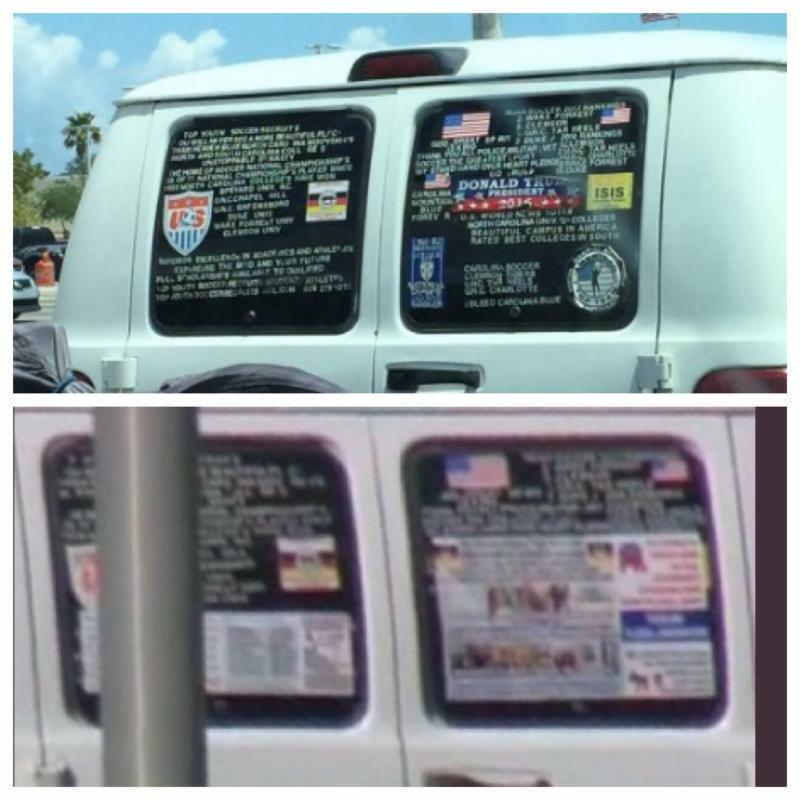 5) Pictures of the “Trump stickers” on Sayoc’s rear window are totally mismatched from one picture to the next. Is this why the FBI put a tarp over the van, when they took it away to their lab? Additionally, as many have noted and as anyone who has ever lived in Florida will tell you, the extreme heat and humidity there are absolute murder on a car. 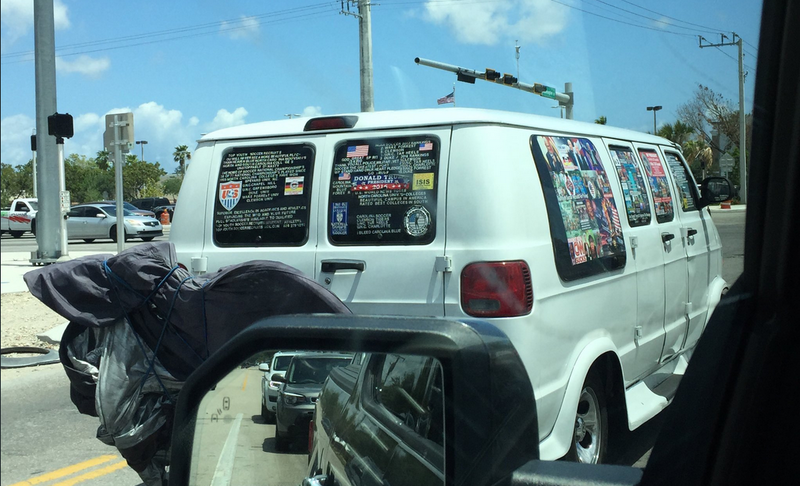 Yet, all of Sayoc’s Trump stickers are totally pristine. 6) An odd detail which may or may not mean anything is that the stamps affixed to the packages are 2016 “Forever” stamps, not 2018. 7) Cesar Sayoc Jr. had multiple aliases, including Cesar Altieri Randazzo and Cesar Anthony Altieri. 8) The corrupt Broward County Sheriff, Scott Israel is in charge of this investigation…the same Scott Israel in charge of the Parkland shooting. 9) Sayoc was a mailroom clerk at Parkland High School! The person who he was congratulating was Enrique “Ric” Prado, then a 25-year veteran of the CIA, serving six overseas posts, including Station Chief in a deliberately unspecified Muslim country. Domestically, he was Chairman of Operations for the DCI’s Counterterrorist Center for Ambassador Cofer Black during 9/11 attacks and subsequent war on terrorism and as a Deputy on the original Bin Laden Task Force as well as a recipient of the Distinguished Career Central Intelligence (the highest award given to senior officers), as well as CTC’s George HW Bush Award for Excellence in Counterterrorism, among others. 11) This is pretty crazy. On October 26th, 2012, Trump tweeted a warning of an “Obama bomb” that would throw the 2012 election. On October 26th, 2018, he tweeted again about “bomb” stuff that could throw the 2018 election! There are many unanswered questions and Dave from the X22 Report does a good job of asking them in this video. Maybe they should have looked at those who have threatened to bomb the Whitehouse, Madonna. Along with the numerous threats made against Trump’s life, I would think those people should have been on the list of suspects. But then, it’s Ok to threaten the US President and send ricin to him and his family, and most of us never hear about it. Everytime someone does something against the Democrats, it is big news, even if the bomb could have never exploded. What a world we live in! I guess money buys everything. Speaking of money, I was checking out the sponsors of the different political entities here in GA. All of the anti-gunners accepted donations from George Soros, Alexander Soros, or both. WTF? Soros don’t have anything to do with GA. I bet they give to all of the anti-gun legislators in your state too!